Well it's been a few crazy days here in Calgary and southern Alberta. We have been in a state of emergency for the last 5 days due to an unprecedented flood. Although I live in an unaffected area (hilltop) it's hard to see the city where I was born and raised ravaged by extreme flood damage. Schools are now closed due to the emergency but my thoughts and prayers are with all my fellow Calgarians (and Albertans) as we start to recover from this unbelievable event. 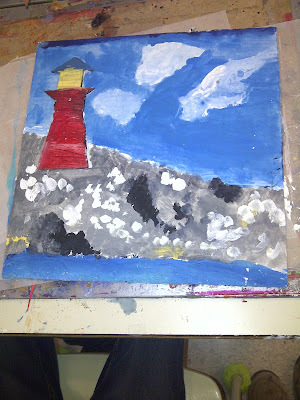 Last week, the day before the flood, I finished this project with two Grade 5 classes who also did the Nautical Inchies. We used cardboard as a substrate (old tri-folds) as well as cardboard pieces to add some 3-dimensional appeal. 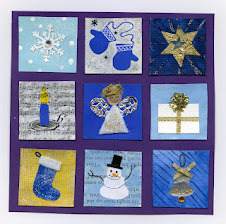 I'll give you the full 'how to' in just a minute but first I have a new giveaway. 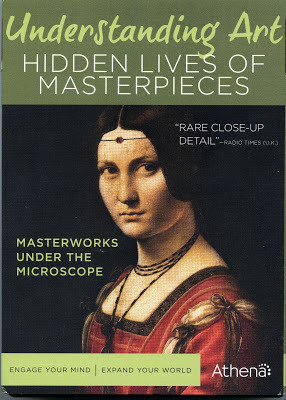 "Understanding Art: Hidden Lives of Masterpieces" is a new DVD series from my friends at Athena and Acorn Media. It is a 5 episode set that documents study days at the Louvre. During study days, works from one major artist are removed from their frames, placed together in one room, and analyzed by a team of curators, historians, restorers, and scientists from around the world. You get to see exceptionally close detail of the paintings as well as discussions on how and why it was painted. With diagnostic imaging and techniques the team is able to look under restoration work, examine underlying sketches and see how the work has been changed or altered. Each episode highlights a different artist. This is a great series if you are an art history buff and interested in the techniques of the Masters. Details on how to enter the giveaway will be at the end of this post. Back to the Lighthouse Project. Draw out your scene in pencil on your base. Use reference photos if needed. You don't won't to focus too much on detail here, just general shapes. 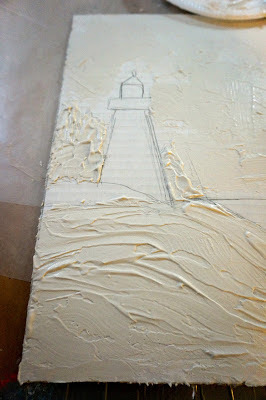 Using scrap cardboard cut out the shapes of your lighthouse. 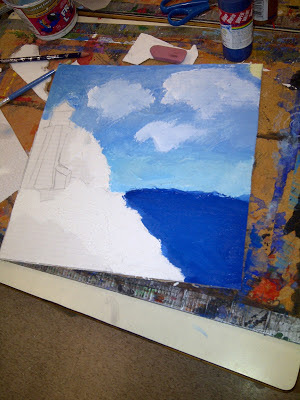 Add some rock shapes of other parts of the scene. 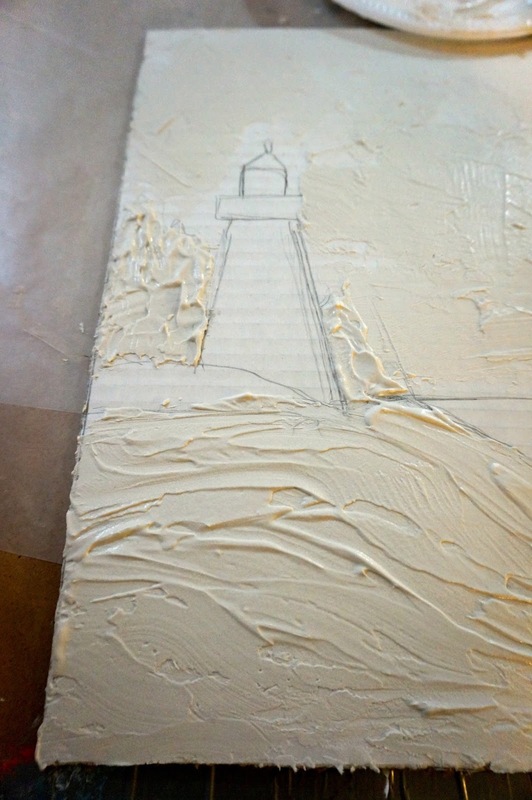 Using drywall or joint compound add a layer to your cardboard pieces. You can use a spatula or old gift card but I find your fingers work great. Add some to your background base as well. Here I put some texture into my sky. When painted it the texture is terrific. 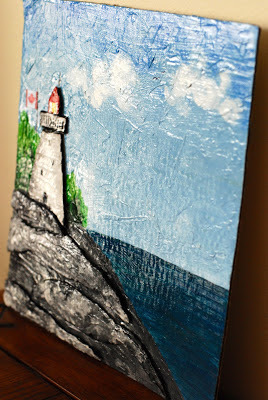 Paint in your background with acrylic paint. 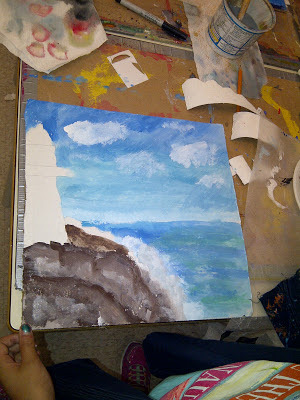 I discussed with the kids how the sky and other parts of the background are not just 1 colour. It's really 3 colours. A mid tone value, a light value, and a dark. I encouraged them to mix the 3 values using the paint I brought in as well as using black and white. They then applied the colours and blended so we didn't have stripes. Before painting our pieces I had them paint the edges black. This helps that element 'pop' from the page. It also covers up the cardboard edge. 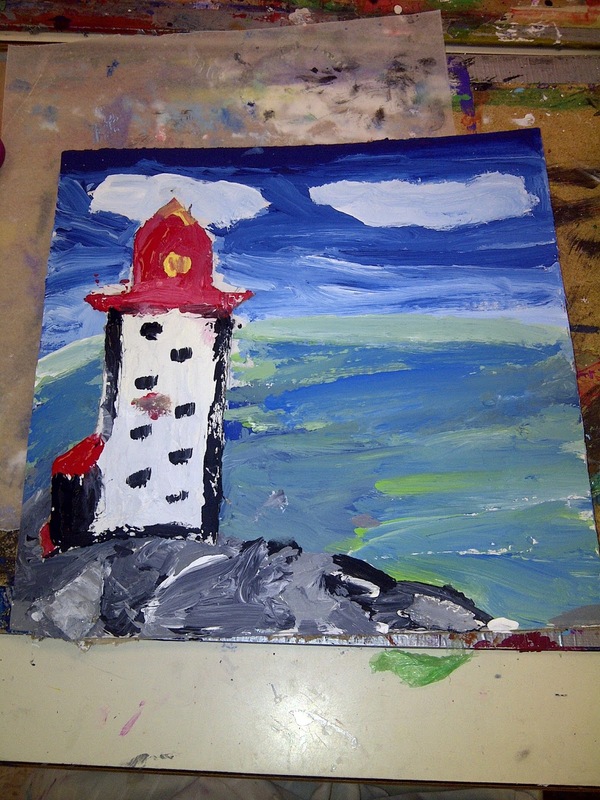 I asked them to paint the pieces lighter than the background as this would also make them appear closer. For example, the rocks pieces are still painted with 3 values, (mid grey, white grey, black grey) but I use more of the whitish grey than I did in the base. We painted the edges of our lighthouses black and then discussed adding shadows. Determine where you think the sun or in some case the moon would be and shadow the opposite side a bit. 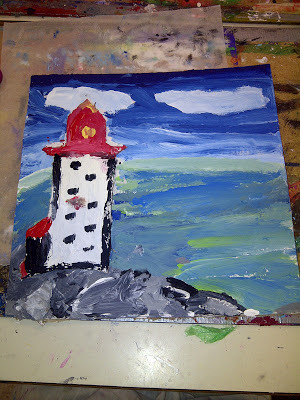 I then gave each of them a piece of ribbon that had a Maple leaf on it and they painted the 2 sides with a band or red. I love this ribbon and use it constantly. Right now is a good time to get it as it's part of Canada Day promos at both the Dollar store and Michaels. Glue all the pieces to the base with tacky glue. Use a fine sharpie to add details like some seagulls in the distant sky and the flagpole. Finally when the paint is all dry add a coat of lodge. It has a nice shiny coat which adds depth to your paint as well as it ensures all your pieces are well stuck on. Love the colours used on this one.....it was like an oil painting. Use of the 3 values in the rocks. 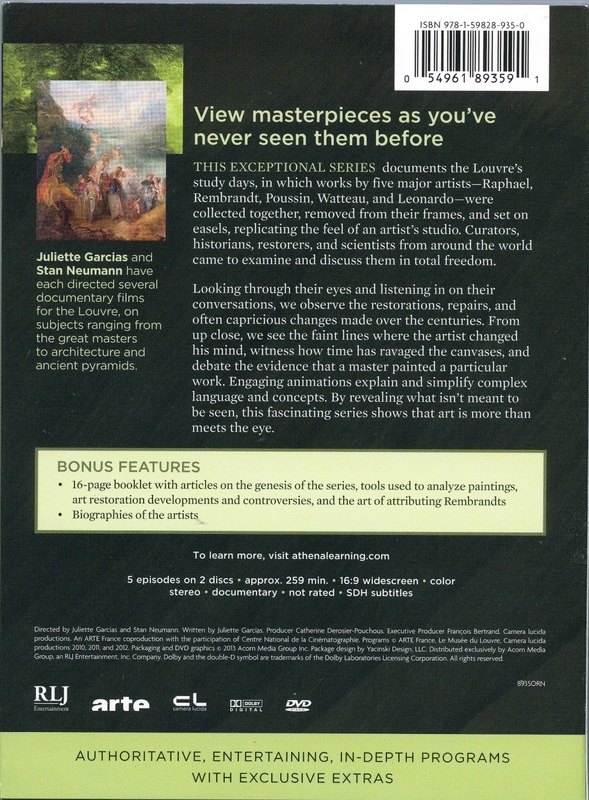 If you want to enter the giveaway for the DVD series "Understanding Art: Hidden Lives of Masterpieces" just enter below. (This is the first time I'm using Rafflecopter so fingers crossed it works). Canadian or US residents only please. 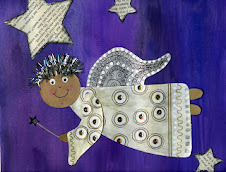 What a wonderful project, and thanks for the tute...should be a great at home on a rainy weekend for some kids! Tried to enter your give-away, but not a fan of or member of Faceplant, so can't do it..maybe an alternative next time? Thanks for letting me know, You're entered by leaving a comment :)! I can't believe what has been happening in Calgary. We had our honeymoon there 11 years ago - it is so sad to see the stampede in the state it is. Watching Highpoint and all the other flooded areas was unbelievable. Great project - love the 3d effect and the texture. I always enjoy your projects even if I can't manage to do them all. I especially get inspired to do things with my mom who has Alzheimers. Sometimes she just watches but either way she becomes happy. Thinking of my Canadian neighbors during this tough time. The news footage was just unbelievable. Great tutorial....will look forward to giving these tips a try. Thanks, too, for the entry into the fantastic giveaway. 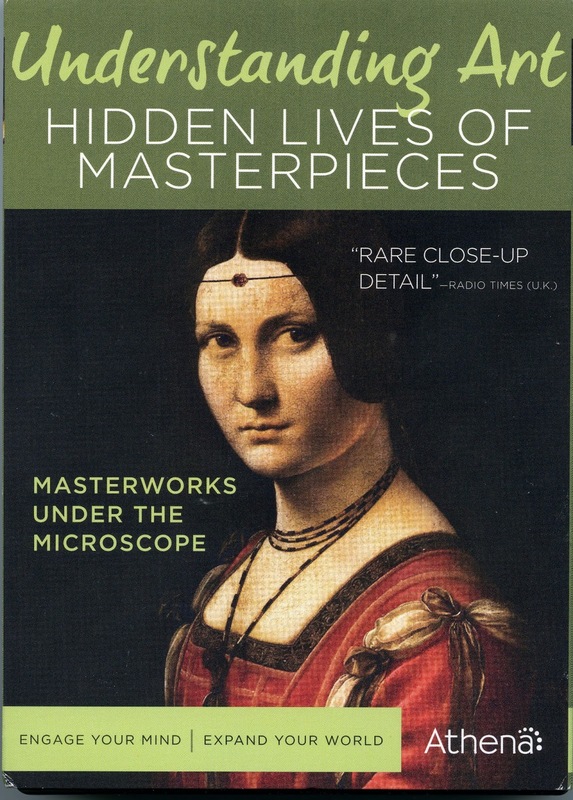 As it doesn't look like I'll be visiting the Louvre anytime soon, much as I'd like to, the "Understanding Art: Hidden Lives of Masterpieces" DVD series would be a great way to get a close-up view of some of my favorite artists. So sorry to hear about the flooding in Calgary and Alberta. Seems so much weird weather as of late. Keeping all in my thoughts and prayers. I love love love these projects! The step by step instructions are clear and your examples are so pretty. Love the project - and the DVD series! It looks amazing! Thanks for the giveaway. I am not eligible to enter (as I live in Tasmania, Australia) but just thought I would let you know that since finding your blog some months ago I have adapted quite a number of your ideas for programs that I help run for students during their school holidays and special needs individuals. Such great ideas that are adaptable for various abilities. Will pray for Calgary - love the project! I love to see how you add dimension to your art - and what amazing lessons your students are learning! Thanks again for this clear post! Love the 3D effect with painting. Thanks for your awesome posts. You seem like an awesome teacher. I love to see your projects. 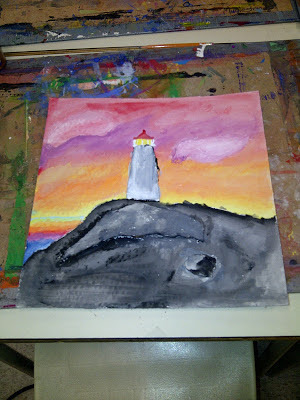 I am trying to inspire young ones at home and in a small art class. 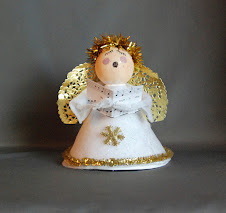 Have step by step details with photos helps as I am not very artistic! Thanks for all of your hard work and directions. I love these projects! The kids did a great job! I enjoy seeing all the wonderful projects you do with your students. Would love to win the DVD series. It would be great to watch this summer! Oh what a great tutorial. Perfect timing. I will have my kiddos do his for their grandmother's birthday next week!!!! I really enjoy your projects. 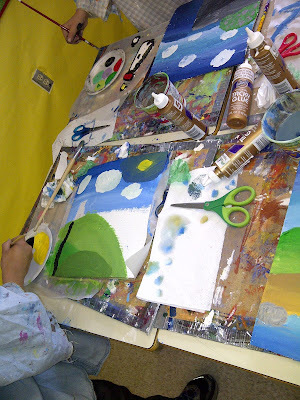 I have some art teacher friends that I will send a link to your blog. I love the way you lay out and describe the steps to us. The projects become so doable. i would love to win this dvd series. My middle schoolers are lacking in their knowledge of the masters. I love this project and it turns out so professional looking even though the steps are quite easy. I would enjoy watching the DVD series with my son who is studying art history next year! Thanks for the opportunity to win! I've always wanted to try joint compound in an art project. Thanks for showing a successful project using it! Loving the projects you've done with drywall compound over the past couple years, Gail. Each one turns out so beautiful. Love the colors in this project! Love the 3D look for this project, and the use of the drywall compound. 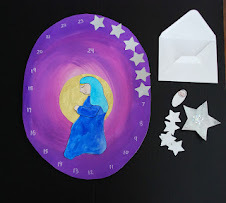 Once again your step by step instructions make this project easy for any teacher. Thanks.